Let’s get one thing clear from the get go: I’m not a fan of the original Anchorman, nor am I the greatest fan of Will Ferrell‘s schtick. It all comes off as too staid, too low brow and down-right too unfunny. It just grates. 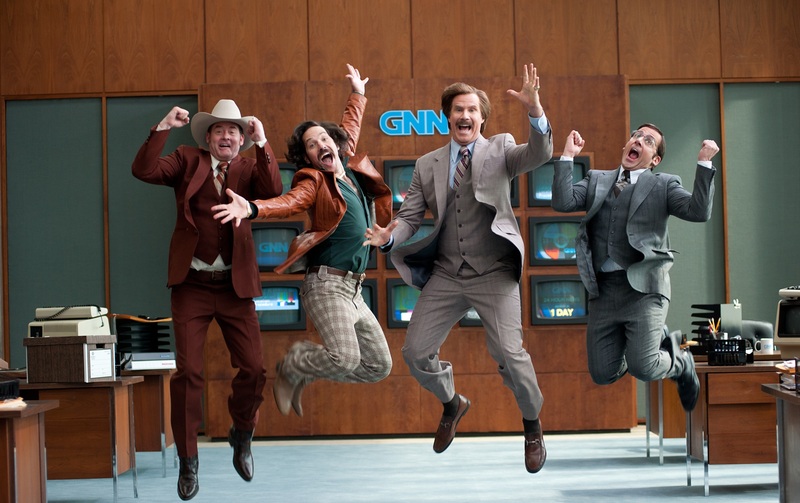 I saw the original Anchorman, found it mildly amusing in places, but never felt the urge to return to it over and over again, like so many others. Plus, what has Will Ferrell produced in subsequent years that has been of note at all? You’ll struggle. He’s had cameos here and there, but none of it has been remotely funny. It just consists of him shouting combinations of words. That’s not humour. Or maybe it is, and I’m just too old for it? 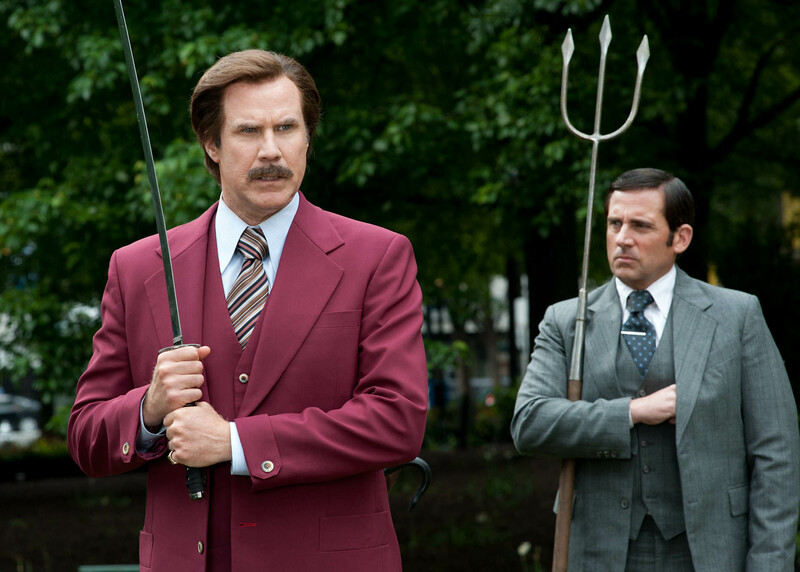 Regardless, Anchorman 2 “picks up” where the first film left off: Ron Bergundy (Will Ferrell) and his new wife Veronica Corningstone (Christina Applegate) are San Diego’s top news anchors, but it all falls apart when Ron is fired. He’s subsequently asked to join GNN – the first 24 hour news network over in New York City; thus leading him to reunite the gang (Paul Rudd, David Koechner and Steve Carrell) to make TV history. Add in a few random plot twists (read: random, not clever) and you’ve essentially got the premise of the film right there. Now, it’s not the basic nature of the plot that bothers me. Dumb & Dumber, which is another “cult” film that’s highly quoted (that I truly love) had a plot revolve around delivering a briefcase. It wasn’t big, nor was it clever, but it was funny. This is something that Anchorman 2 fails to be on all levels. The jokes either wear out their welcome very fast (see the image earlier), miss their mark entirely or are just copy and pastes from the original. Really, I shouldn’t have expected any less from Will Ferrell, as he’s not a gifted comedian given recent evidence. It’s quite telling that the most memorable moments were the cameos. It had people gasping and nigh-on applauding to see some of them. Although I won’t ruin the fun for anyone here, it’s easily the best bit of the film: seeing who else is in here! It’s ruining nothing to say that the film of course has walk ons from some of Will Ferrell‘s acting buddies that he’s appeared in numerous films with. Plus, within the first two minutes of the film you have a walk-on from Drake (who won’t be the only hip-hop star to grace the screen). What’s more interesting is the calibre of some of the actors that appear in the closing 15 minutes. You’ve got some true A listers of comedy, film and musuic, and some true movie whores too; ones that’ll seemingly appear in anything nowadays. The fact that the “ooo, who’s next?” was the best bit of the film is rather telling… as it didn’t actually feature Will Ferrell all that much. 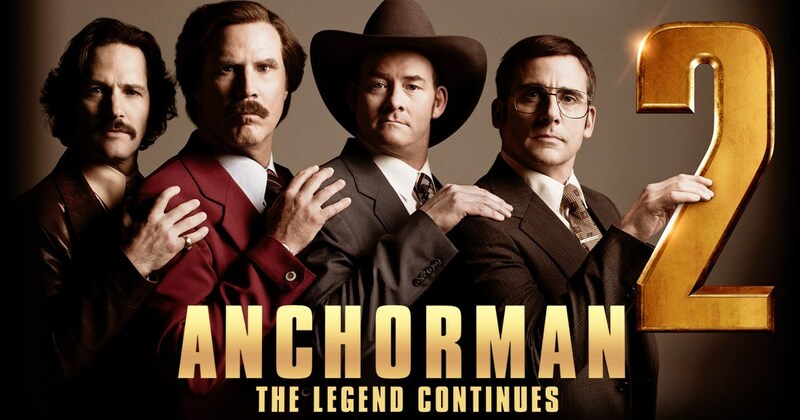 Anchorman 2: The Legend Continues is a legend that is hopefully now concluded. Surely this cannot be stretched into a trilogy?! But I guess if the money pours in at the box office, then we may inevitably see Anchorman 3: The Legend Concludes. Ultimately, if you enjoyed Anchorman and could laugh over and over again at those jokes, then this film will probably appease you. If, like me, you found the first film a bit “too” stupid, then this will do nothing to change your mind. We’re just hoping that Dumb & Dumber To doesn’t fall into the same bin as Anchorman 2. Surely Jeff Daniels & Jim Carrey can pull out another classic as Harry and Lloyd? But that’s the risk… if you produce a “cult” classic then return to it several (or nigh-on 20 years later for Dumb & Dumber) you’re running a huge risk. I’ve yet to see it work for a comedy if I’m honest, as the temptation’s there to just repeat past jokes. Here’s hoping Harry and Lloyd had done wonders with that worm farm… and it’s not just that Petey’s head’s fallen off. Again. This entry was posted in Review and tagged 70's, 80's, Anchorman, cameos, comedy, Kanye West, news, Paul Rudd, Ron Bergundy, Sacha Baron Cohen, Steve Carell, Tina Fey, Will Ferrell, Will Smith. Bookmark the permalink. Anchorman totally passed me by and nothing I’ve heard since has made me want to watch it. I want to like Will Ferrell but the only thing I ever enjoyed him in (in terms of comedy) was Zoolander. I have friends that worship at the alter of Ferrell, but I just don’t get it. Especially when these friends are really intelligent folks. Makes me think I’m inherently broken for not getting it though! Good review. It was funny, but not nearly as much or as consistently funny as the first. It just left me frustrated and cranky. I think I gave it another star based purely on those cameos, which were a pleasant distraction from Will Ferrell and “that” humour! Not surprised by your score. I wasn’t a big fan of the first film. I know it has tons of followers but it did little for me. This one didn’t look much better. 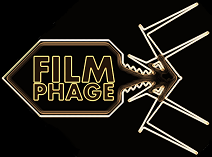 Good review Phage! It’s literally only worth watching for the 3 minutes of cameos in the end to go “oh wow, he/she’s in this too? Oh, ok then” – not funny, just interesting. Like a car crash.